The Nelson & Trafalgar Collection. 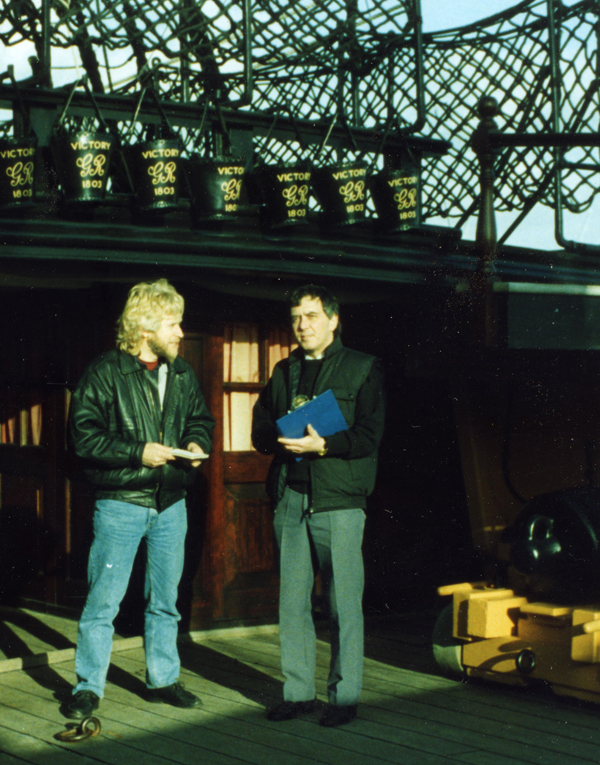 I was honoured to be the Official Artist to HMS Victory, 1993 to 1998 and have remained involved with this subject ever since. 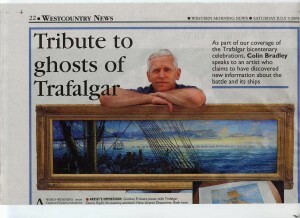 Why was Trafalgar important? The battle ended the serious threat of invasion, Napoleon had 350,000 troops ready to embark. 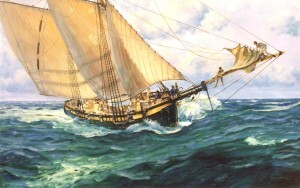 Trafalgar remains an important symbol for all free peoples. Click on the images to see larger versions, the blue image titles are hyperlinks that will take you to further reading on that painting. 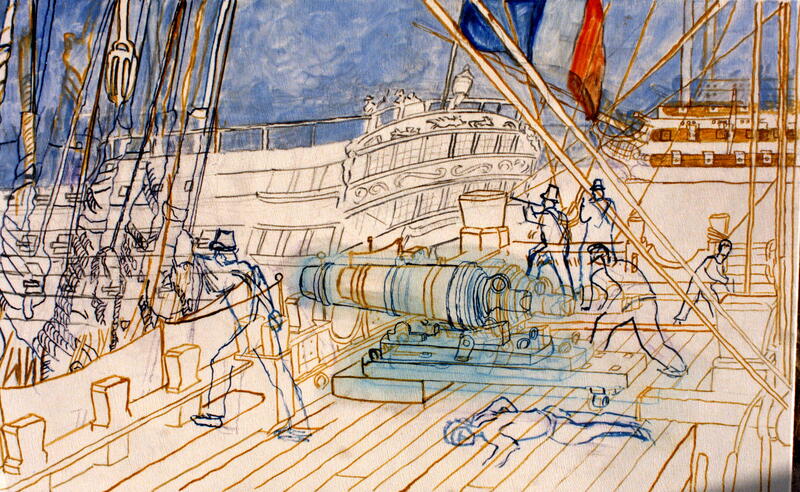 My brief was to ‘paint so of the less well known but interesting aspects of the stories of Nelson and HMS Victory’. 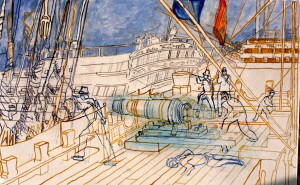 This ‘Nelson and Trafalgar Collection’ represents an unrepeatable life experience. 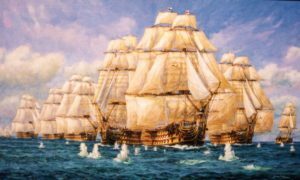 Situations change, a time that witnessed the production of this remarkable series is now its self part of the Nelson and Trafalgar story. Today HMS Victory is magnificently preserved at Portsmouth Historic Dockyard, part of the naval base and open to the public. 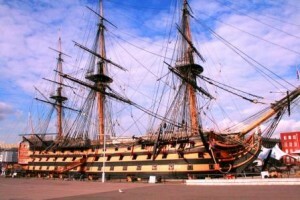 To Visit HMS Victory is to have an experience you will never forget. 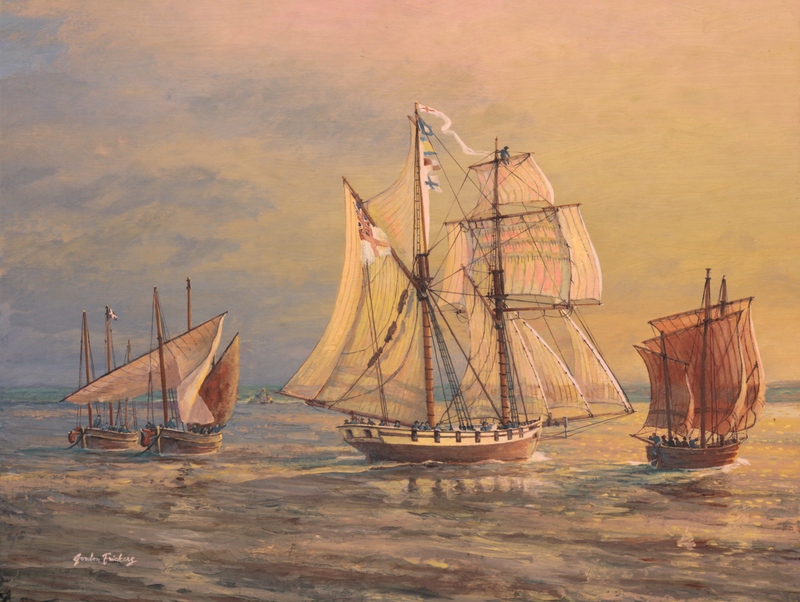 As a collection these paintings have only been exhibited once, privately by Rochay Elite who created a “Trafalgar Soirée” (at The Army & Navy Club, St James, Pall Mall, London, October 2016). When official artist to HMS Victory, I had access to leading experts and rarely see documents in Britain, France and Spain. 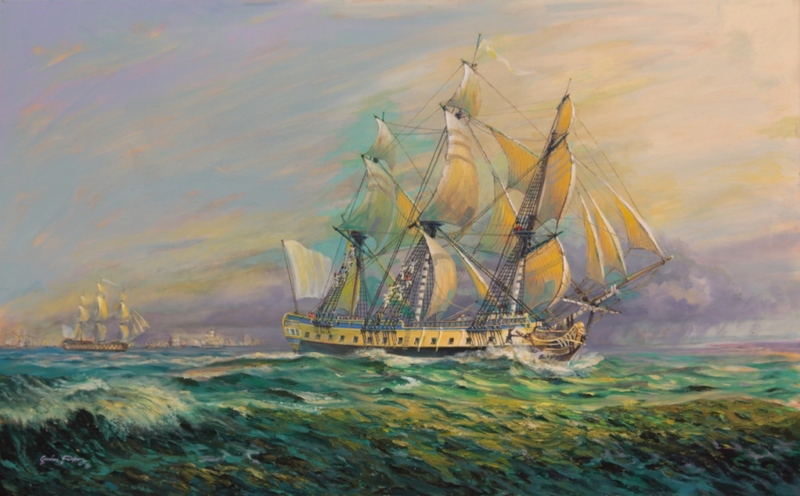 The collections included British, French and Spanish ships of the Georgian and Napoleonic period, original documents, journals, letters and mementos. 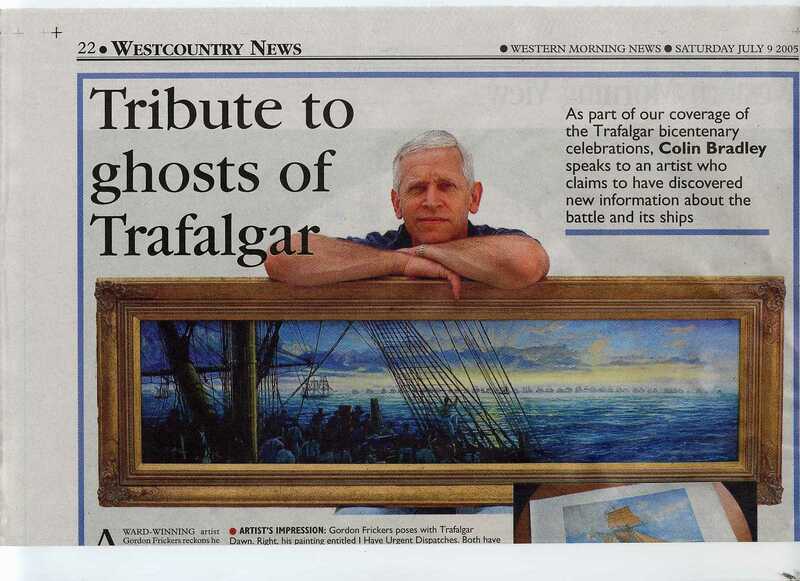 Hyperlink > Nelson & Trafalgar Collection, Trafalgar Dispatch, “The Trafalgar Messenger“. 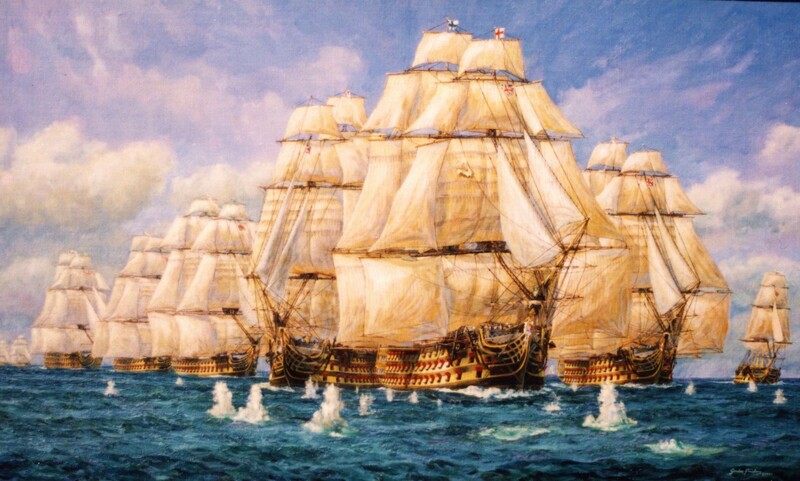 HMS Victory is iconic; the only surviving example of a type of 100 + gun war ship that was at one time the pride of the fleets of great nations, the First Rate Ship of the Line of Battle. It is as if only one castle had survived to our time. 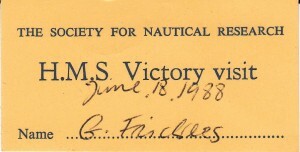 By happy chance Victory was also one of the finest and most distinguished First Rates ever built. 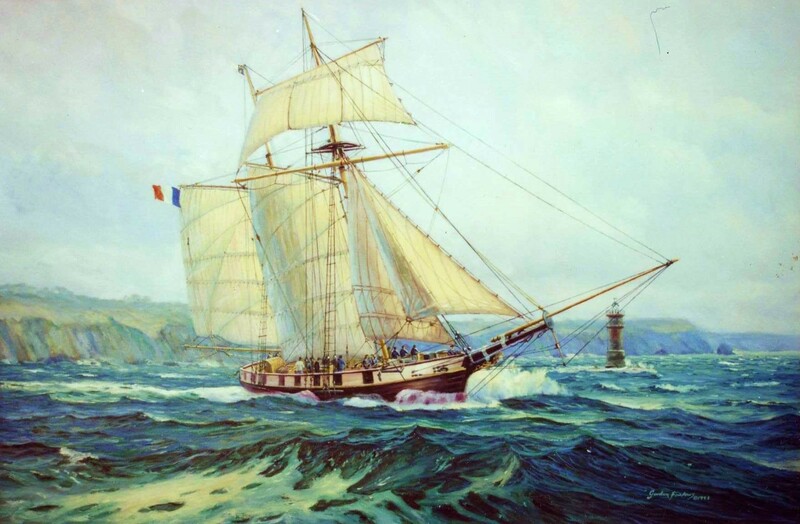 “Come, cheer up, my lads, ’tis to glory we steer“, the opening line of Hearts of Oak, anthem of the Royal Navy. 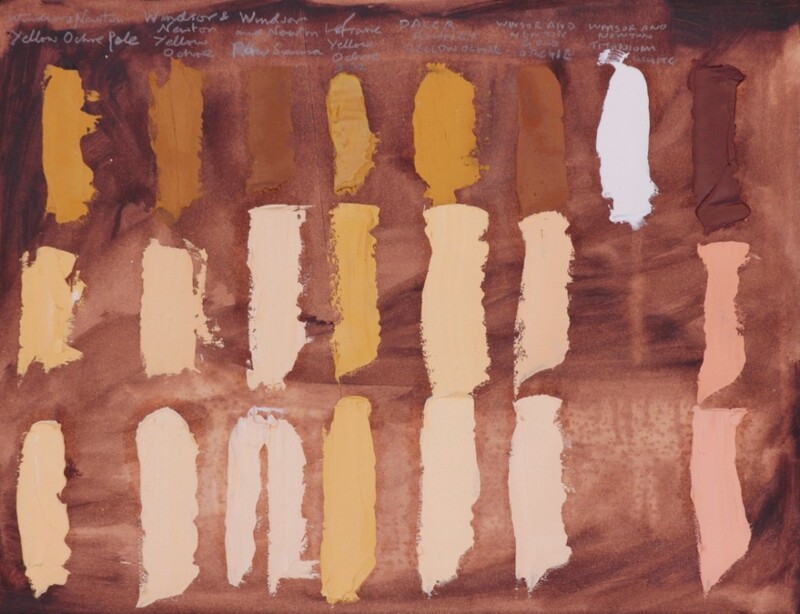 We should be focused on you commissioning a painting or buying print, what the heck, your pleasure the rest of the text is under ‘miscellaneous’ on this page. This story is addressed briefly below and in more detail via the “Further reading” a link appears after the last painting. 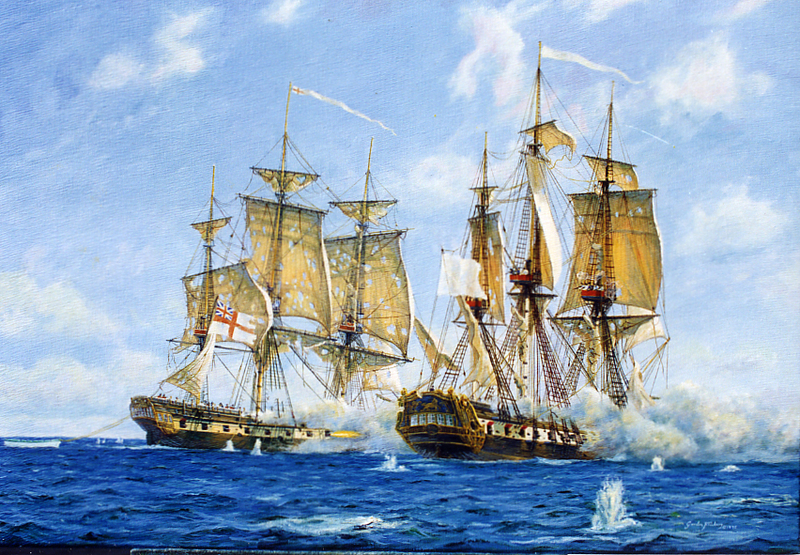 The battle of Trafalgar, 21 st October 1805 caused a key change in European therefor world history. HMS Victory was the British Flag ship. Hyperlink > Trafalgar Dawn, the French Perspective Original, price upon application. 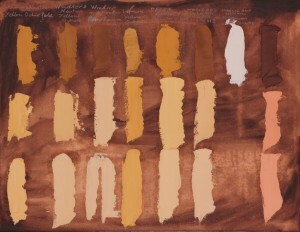 Available in print from £147. 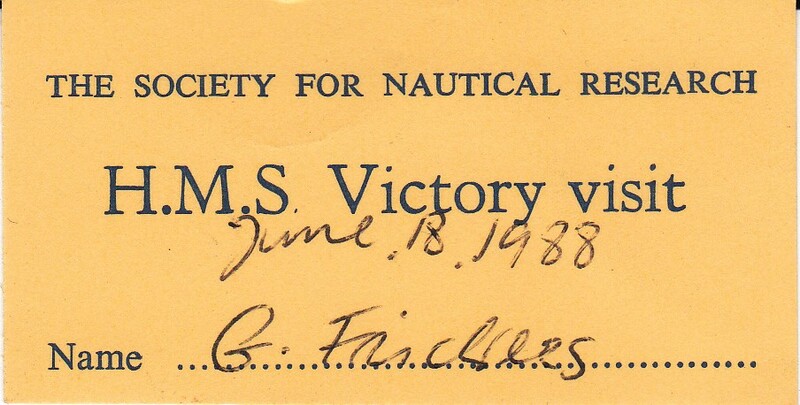 I had the great good fortune to have a letter of introduction from Commander Mike Cheshire, HMS Victory’s Captain, a letter that opened many other doors, many archives, including in London, Plymouth, Liverpool, Taunton and France [Brest, Paris] and Spain [Mardid, San Sebastian, Cadiz]. Nelson’s Column available, price upon application. 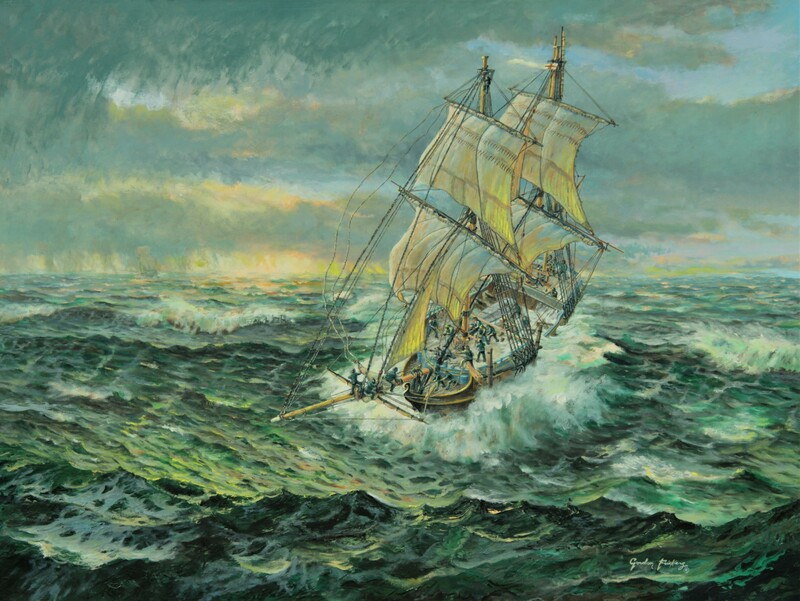 Victory‘s most famous Admiral, Horatio Nelson was an idealistic, innovative and personally very brave man. Nelson was a warm hearted fellow, considerate of others, tremendously brave [on the eve of Trafalgar he is quoted as saying “this will be my 106th action”]. He was much loved by many including the plain Jack Tars. 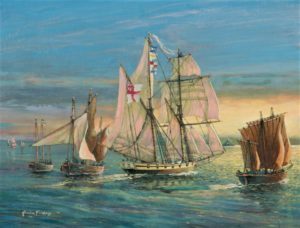 He lead an heroic life with high moral standards so is justly considered Britain’s foremost naval hero even eclipsing great seamen like Francis Drake, Hawkins, George Anson and James Cook. All of those and many other English sea men together certainly changed world history. “Nelson’s Bright Yellow” available, price upon application. 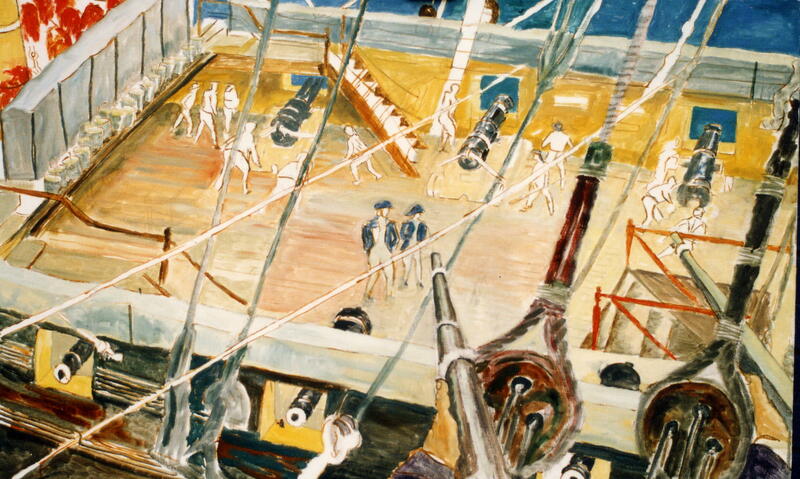 The story behind and results from “Nelson’s Bright Yellow’ included some extraordinary discoveries that challenged established views regarding the appearance of Nelson’s ships. They are reflected in this collection. For young people looking for role models, I would recommend they find [Amazon?] 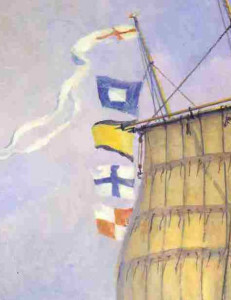 and read a copy of The Life of Nelson by the American author Captain A. T. Mahan [USN] written in 1897. 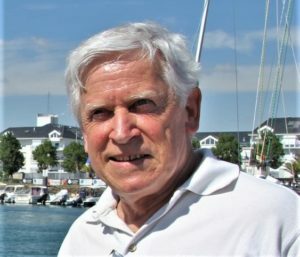 Mahan was an American naval officer and historian who was a highly influential exponent of sea power in the late 19th and early 20th centuries. Hyperlink > HMS Pickle, first with the news available, price upon application..
Hyperlink > Hermione, frigate available, price upon application. 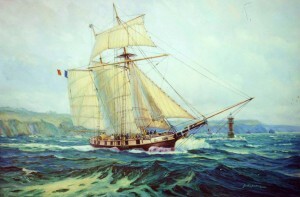 A typical French privateer of the period, the painting celebrates the superb replica built at Brest, launched 1996. 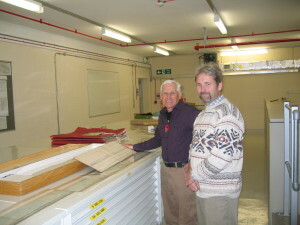 Examining the water colours made at sea by order of King George III by the official marine artist Serres, Gordon Frickers with Guy Hannaford, in the UKHO. 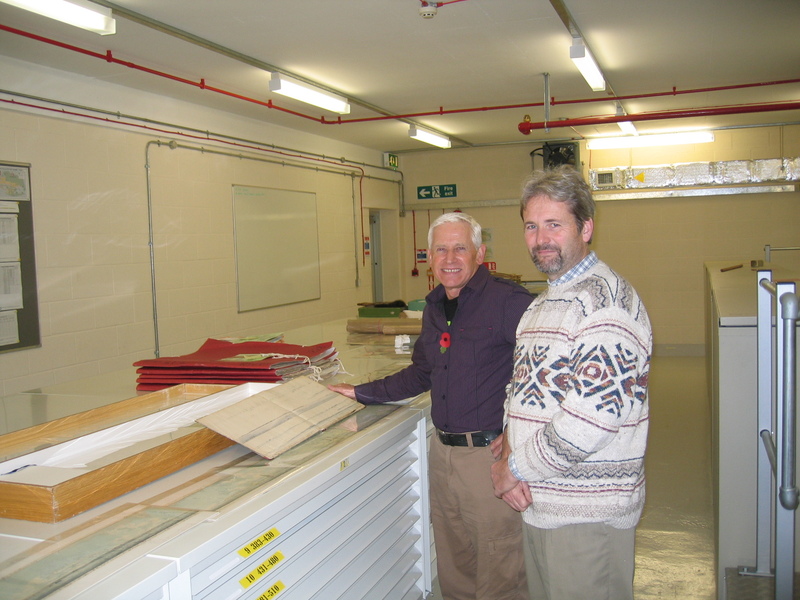 An example of exceptional and meticulous research was Gordon’s visit to Her Majesty’s Hydrographic Office, Taunton. A huge, secure government complex definitely not open to the public where for generations ‘Admiralty Charts’ have been and still are produced. The Western Morning News, a typical ‘Trafalgar’ research story. 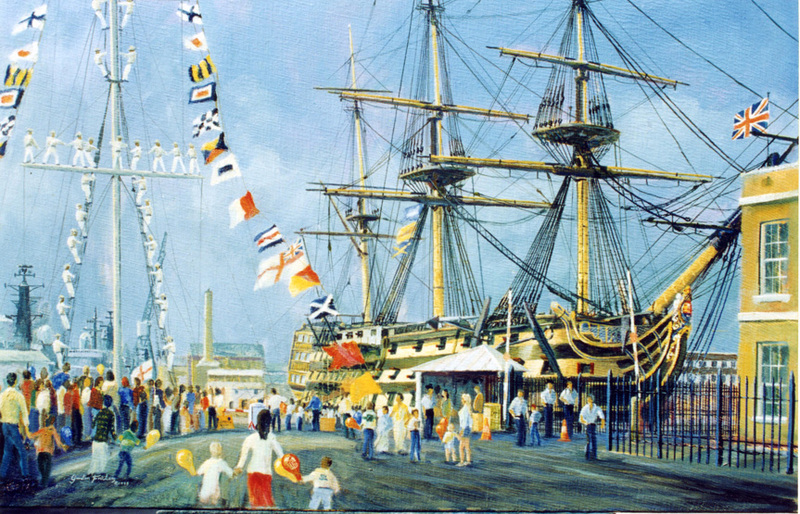 While producing this Trafalgar Collection I visited by appointment among other places The Tate Gallery, Maritime Museum Liverpool and office of Sea Breezes magazine, Liverpool, The Liverpool Tate Gallery, The Naval Reference Library Plymouth, Devonport Royal Navy Dockyard, Portsmouth, Brest and San Sebastian NavalbBase, The National Maritime Museum, Greenwich, London, the Royal Naval Museum Portsmouth, Brest Maritime Museum, the National Maritime Museums and military archives of France (Paris) and Spain (Madrid), with French colleagues, Cadiz University and out of yet more curiosity, Cape Trafalgar. 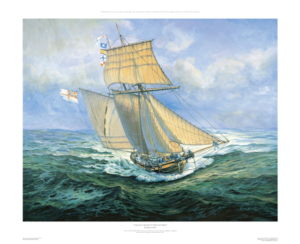 Hyperlink > Sailing into Legend [HMS Pickle 04.11.1805], available. 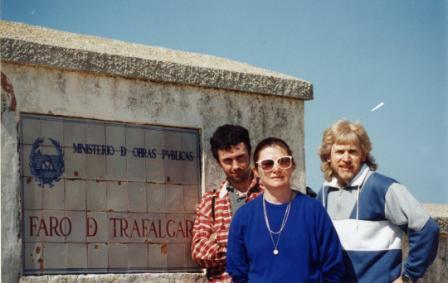 A very big THANK YOU one and all goes unreservedly for the good will and good humour of many people in Britain, France and Spain contributed to this amazing Trafalgar Collection. I wish I could name you all and shake your hands again. 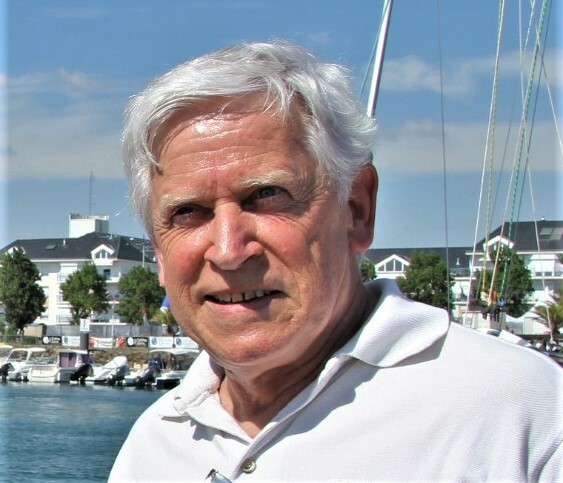 In particular I would like to thank my principal sponsors, Nick Varley, David Ellingham and John Mitchell, Mr. Peter Goodwin, Michele Huve & the Brest Jumlarge, Lt Cmdr Mike Cheshire (Captain, HMS Victory) , the directors of Victory 2005 Ltd and M. & Mme Linquet of Brest. Further Reading: < This is a hyperlink to an expanded introduction to this awesome series, enjoy. Come, cheer up, my lads, ’tis to glory we steer, To add something more to this wonderful year; To honour we call you, as freemen not slaves, For who are so free as the sons of the waves Heart of oak are our ships, jolly tars are our men, we always are ready; Steady, boys, steady! We’ll fight and we’ll conquer again and again. 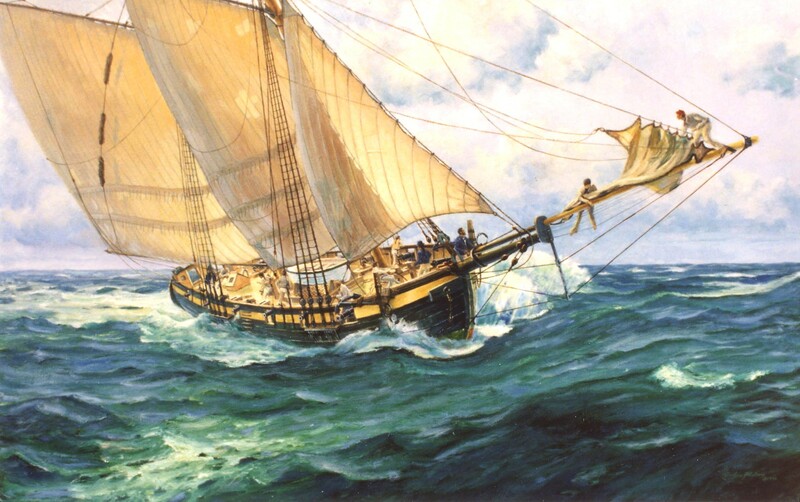 We ne’er see our foes but we wish them to stay, They never see us but they wish us away; If they run,why we follow and run them ashore, And if they won’t fight us, what cannot do more. we still make them feel and we still make them flee, and drub them at shore as we drub them at sea, so cheer up me lads with one heart let us sing, oh soldiers and sailors, our statesmen and king. Thank you Randy Wright, an interesting reply. I’ll check out the references you have thoughtfully provided. 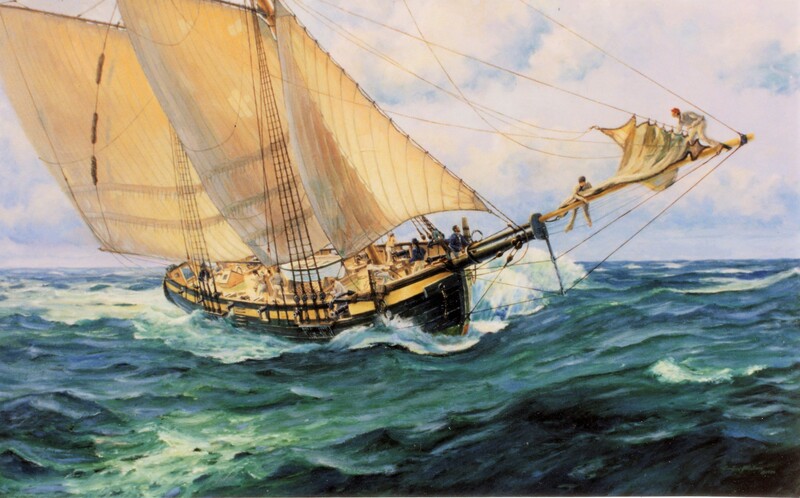 I’m aware of the Chinese voyages, have read a little of the archaeology but never read a thorough summary. Re reading my response, if you don’t object, I’ll add this as a ‘letter to a colleague’ on my web site, “Nelson and Trafalgar Collection” page. 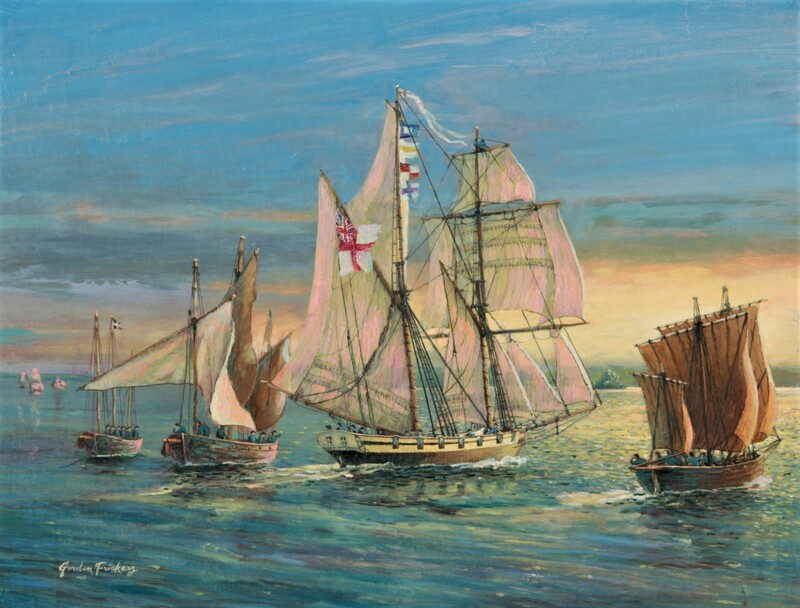 I’m fully aware that history as presented is often short on facts, for example I thoroughly researched when I painted my “Nelson and Trafalgar Collection” back in the 1990’s. 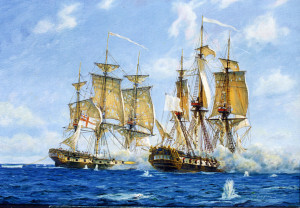 https://www.frickers.co.uk/art/marine-art/war-ships/the-trafalgar-collection/ when official artist to HMS Victory. I was also told Nelson had a girlfriend in Cadiz so regularly, discreetly visited. 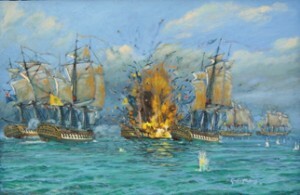 The British were very skilfully lead by Nelson and his captains, they too fought bravely and behaved impeccably. I completely agree with you re revisionist history, it’s not just something the Muslims have invented, likewise, false news.